How to Remove “Powered By Blogger” Attribution Gadget In Blogger-The attribution gadget is a gadget present at the footer of the blog and says “Powered by Blogger”. When you start a new blog, This gadget is locked, and you can not remove this gadget. when you click on the edit link of attribution gadget you will notice that there is no Remove link,Because the gadget is locked officially by the blogger.If you want to unlock so that you can remove it then follow my below easy steps carefully. Make search simply Control + F and paste the below code. Now save your template and go to the Layout page. 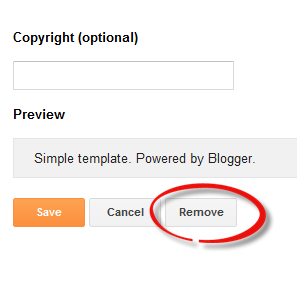 Now you are able to remove Powered By Blogger” Attribution Gadget In Blogger. Click on the edit link of attribution widget. Click on Remove button and it will be removed and you are done. If you like this small tutorial then share this with your friends. And if you face any errors/issue then contact me OR comment me on this blog’s post.